This is the best French Martini! It’s got the classic flavors plus sparkling wine to make it sophisticated and more celebratory than ever. 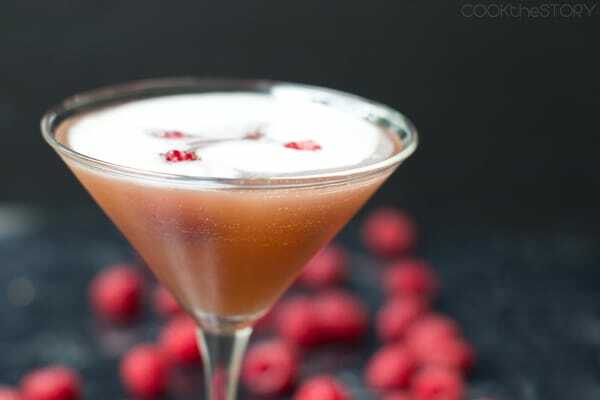 One of my favorite all time cocktails is the French Martini. Have you ever tried it? It’s not technically a martini since it’s pretty sweet with no vermouth in sight. Instead, it’s one of the drinks that launched the anything-is-a-martini-if-you-put-it-in-a-martini-glass craze. And what a fun craze that was! 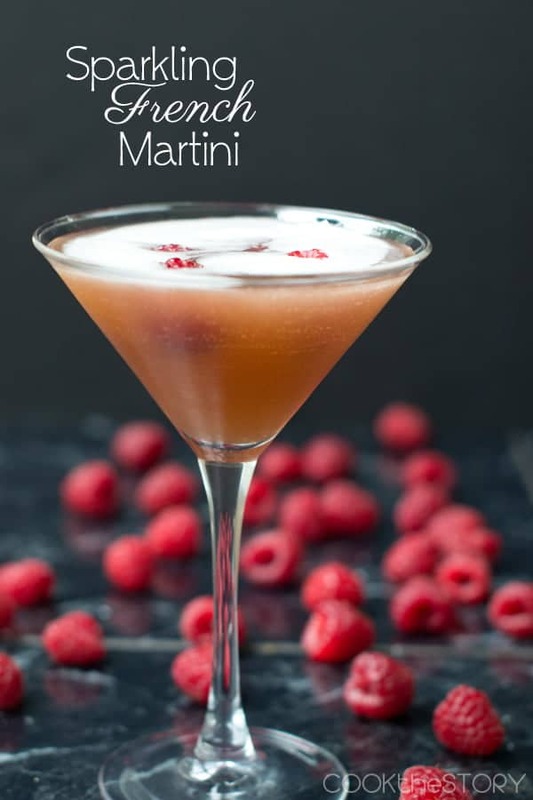 A French Martini is typically made by mixing vodka, pineapple juice and Chambord liqueur in a cocktail shaker with ice and then pouring it into a martini glass. 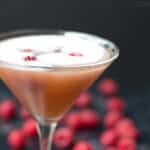 It gets this nice frothy top – watch out for a French Martini mustache! To finish this version off, and to make it more celebratory, you top each glass with a bit of cold sparkling wine. Nothing sweet. A nice brut. But even though this is a “French Martini” you need not spend tons on French Champagne. Instead, stray over to Italy and get a cheaper Prosecco. No worries. A word of caution. You really really need to use Chambord in this. It’s a French raspberry liqueur made from raspberries, honey, vanilla and cognac. The other kinds of raspberry liqueurs that I’ve tried to use are either way to sweet-and-sour flavored (like a Jolly Rancher, which I would otherwise like, but not here) or very medicinal. Trust me on this. Save money by buying inexpensive bubbly but don’t opt for the cheaper version when it comes to the liqueur. The cocktail will taste pretty bad if you do. Sorry about that. I hope you like this version of the French Martini. I think it will be perfect for New Year’s Eve or anytime you want to have a sophisticated celebratory drink on hand. 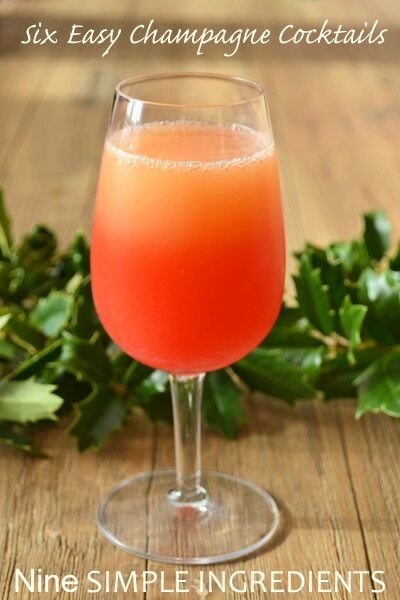 If you’re doing a bubbly cocktail for a party, why not do six? Here’s a great idea for you! Make a DIY Champagne Cocktail Bar. With this recipe you buy nine ingredients and from them you can make six different Champagne cocktails. Print out the six recipes, put the ingredients on a table, counter or bar and then let your friends mix and taste the night away. Here are the ingredients and recipes for the cocktail bar. Another celebratory drink! 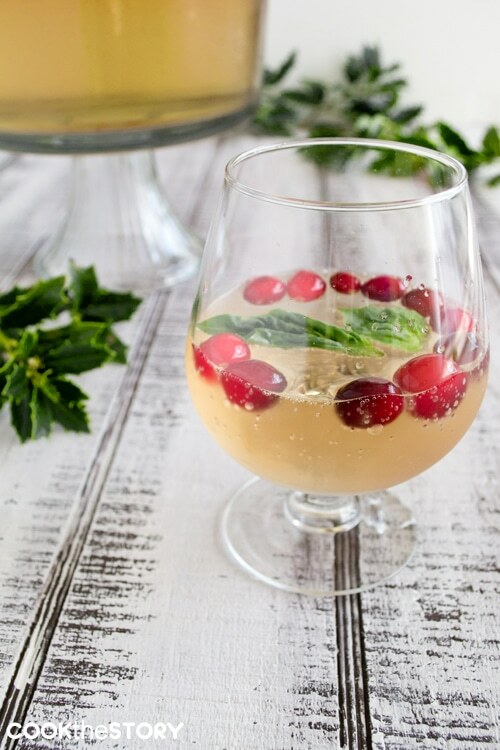 Try this Champagne Punch made with sparkling wine, ginger ale, basil and cranberries. It’s festive, fun and beyond delicious! Although I love French martinis, I’m allergic to pineapple. Any suggestions for substituting the pineapple juice in this recipe without sacrificing flavor? Sherry, the key, I think, is to find something that is sweet and tart and has a tropical. I’d try mixing equal parts lemon juice with mango juice (or a mango orange blend, things like that are available at grocery stores) or equal parts lime juice and orange juice. I’m concerned that the second option won’t be sweet enough. Pineapple juice is a lot sweeter than orange juice. It might therefore need a touch of simple syrup or honey. Whichever route you go, what I’d do is to mix the juices up first and get it to a place where you really like the flavor. Then use it to make the cocktail. Thanks for an awesome write-up on one of my favorite cocktails (which so many people do wrong!). I love the idea of adding some bubbly to it! You’re welcome, Kelsey! It’s one of my favorites too. I think I’ve found my New Year’s cocktail!